Community gardens are a big part of the experience in this zone, while local parks provide a place a place to pause, relax, and play. Provides a series of garden rooms for seating, public art, and native planting. This area is defined by landscaped nooks for people to sit, relax, and enjoy the views to English Bay and the mountains. The design for this zone adds more landscaping to the existing tree canopy to create a Pacific Northwest forest-like experience. Lookout points celebrate views of the North Shore mountains. A variety of seating areas and informal landscaped areas. This zone celebrates the existing Victory Gardens on the eastside of the greenway, using wildflowers and native plantings to enhance biodiversity. Zone 7 features a variety of recreational opportunities, such as giant chess, ping pong, and bocce, and includes a small community gathering area at West 60th Ave.
A fully-accessible lookout tower with views to the Fraser River Delta and Vancouver International Airport is the major feature in this zone. The Arbutus Greenway will be a defining element of Vancouver’s urban landscape as a vibrant and beautiful public space for walking, cycling, and streetcar. 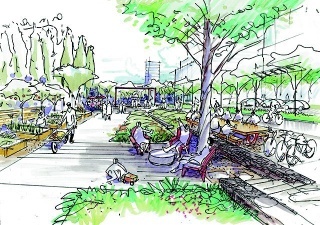 The Arbutus Greenway is a future, north-south transportation corridor that will connect people, parks, and places from False Creek to the Fraser River. It will reimagine a historic rail corridor and will provide a high-quality, accessible public space for walking, cycling, and rolling. It will be a destination that fosters both movement and rich social interaction – inspired by nature and the stories of the places it connects. We have built a temporary path while we plan and design the future Arbutus Greenway. Come enjoy the space and explore the corridor! Construction could begin in 2019, subject to availability of funding. Learn more about opportunities for public consultation. Explore the greenway and discover parks, neighbourhoods, and scenic views. Find related documents and background information. Our YouTube playlist featuring the Design Jam, travel tips, and more.